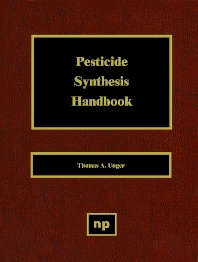 The objective of this Handbook is to describe the basic synthesis route(s) for the manufacture of 687 pesticides. Important additional information includes the five appendices: I. Generic Names: The Generic Name Appendix indicates the chemical function of the compound. If the compound has more than one function, all functions are indicated. In this case, the synthesis route of the compound is found under the first function indicated in this Appendix. II. Trade Names: When only the trade name of the product is known, the corresponding generic name is found in this Appendix. III. Raw Materials and Intermediates: This Appendix lists all pesticides, the synthesis of which uses a given raw material or intermediate. IV. Synthesis of Raw Materials and Inter-mediates: The synthesis routes of Raw Materials and Intermediates are presented in this Appendix. V. Chemical Functions: This Appendix lists all products which have the same chemical function. The systhesis route(s) for each product are described under the heading of the main function. When a product has more then one main chemical function, it is listed under all its functions. An abbreviated Contents is listed below; the number in ( ) indicate the number of pesticides in that category, whose synthesis is described. Users and manufacturers of pesticides. Good book. But is incomplet.this book dont transfer to you all informations necessery to start .